The Department of Dietetics at Capitol aims at providing nutrition care plans for the patients. Experts at Capitol believe that people’s nutritional state can protect them or predispose towards a chronic disease. A balanced nutrition is essential for a good health, physical growth and development. Moreover, to regulate the basic body processes a nutritional food is required. Medical treatment for several diseases includes diet therapy. Thus, nutrition is both a preventive and therapeutic science. Nutrition is an integral part of treating and preventing different ailments. The noteworthy journey of maintaining good health begins by making healthy diet changes and frequent visits to dietitian. It is essential to get a complete dietary analysis done to ensure that all the additional requirements are met. 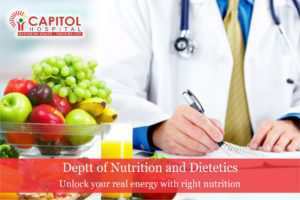 For outpatient care, Capitol offer services like Daily OPD, Bariatric diet clinic, Oncology diet clinic, Antenatal diet clinic, while for the indoor patient care, we organize daily visits by dietitian, make nutritional assessment of all patients at the time of admission, and plan diet according to their therapeutic requirements.